100th Class in Iowa...and counting! The Iowa State University farm management team received an award for teaching more than 100 Annie’s Project courses in Iowa. Presented during the annual ISU Extension and Outreach for Agriculture and Natural Resources conference on April 2, 2018, the award recognizes teams for outstanding program development and responsiveness to clients. Serving the needs of the women in agriculture audience supports extension’s signature issue of food and the environment. Just 16 years ago, women were 42 percent of the undergraduates in the ISU College of Agriculture and Life Sciences. Today that number has jumped to 52 percent. The 32,167 women farmers in Iowa represent more than one-fourth of all Iowa farmers according to the USDA NASS 2012 Census of Ag. Two-thirds of these women are juggling both on-farm and off-farm careers. The 2012 Study of Farmland Ownership and Tenure in Iowa shows women in Iowa own 47 percent of all Iowa farmland. The 2015 study of Gender Roles & Equality in Agribusiness reported more than 90 percent of men and women completing the survey felt women were an integral part of agribusiness. Responding to the needs women identified, the farm management team taught 109 Annie’s Project courses for women between February 2004 and March 2018. Through innovative agricultural risk management education, the team improved the lives of more than 1,922 women participants impacting multiple generations, farms and families. Annie’s Project is the agricultural business education program that empowers farm women to be more knowledgeable about their agricultural businesses. Annie’s Project creates a comfortable and supportive learning environment focused on the best farm business management practices. Kelvin Leibold, ISU Extension and Outreach Farm Management Specialist stated, “All of the team players have looked and said, well, Annie’s Project takes a lot of work, but it has a lot of outcomes.” Farm management team members, county extension professionals, sponsors, and others agree it’s worth the extra effort. “I go back and look at some of the leadership shown by women that were involved in the early Annie’s Project programs, and see what they’re involved with today, and it’s really rewarding for someone that’s been around Extension as long as I have,” adds Kelvin. The farm management specialists and many other extension colleagues have a long term dedication to providing educational opportunities for women in Iowa. After more than 14 years of programming, the Annie’s Project local, small group, multi-session, 18-hour courses continue to be requested by women in Iowa. Recently, there were nine Annie’s Project courses from January thru March, 2018. Women across Iowa recognize and value the branded Annie’s Project program; and they trust Extension to provide research-based information and tools to help them make good farm management decisions. .
Ruth Hambleton, a former University of Illinois Extension Farm and Marketing Specialist, created Annie’s Project in 2003 and named the course after her mother, an inspirational farm woman. The ISU farm management team members contributed significantly to expansion of this valuable program across the nation. In 2017, there were 33 states offering Annie’s Project programs. Kelvin Leibold currently serves on the board of directors for the Annie’s Project – Education for Farm Women non-profit organization. In addition to Annie’s Project, the farm management team taught 64 other multi-session farm management courses for women for more than 826 Iowa women between January 2009 and March 2018. Based on needs assessment and evaluation activities, the team developed eleven new courses for women: Women Leasing Land (2005), Women Managing Cattle (2010), Women Marketing Grain (2010), Investing for Farm Families - an online course (2011), Managing for Today and Tomorrow: Farm Transition Planning (2012), Annie’s Project focused on Business Planning (2013), Moving Beyond the Basics of Farm Finance (2014), Women Managing Dairy Cattle (2014), Heartbeat of the Farm Human Resource Management (2015), Women Managing Crops (2015), and Women’s Roles in Farm and Ranch Transition Planning – an online course (2016). With the help of the farm management team, these courses and programs have been adapted and taught by extension educators in other states. 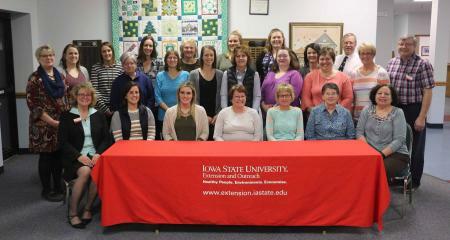 The ISU farm management team extended the impacts of risk management programs for women by leading professional development for more than 211 educators from 31 states at 9 professional development events between 2012 and 2015. The farm management team acknowledges, values and supports the important role of county professionals and other extension colleagues in achieving program and client success. They established program processes to increase efficiency and customer interaction such as statewide online registration, monthly client-focused newsletters, and online evaluation tools. They also organized 16 statewide planning and professional development meetings since 2010. There were 65 attendees at the October 2017 statewide planning meeting. These meetings increase awareness about risk management education, spark interest in serving the audience of women in agriculture, and allow extension professionals to share best practices and improve skills. Grant writing is an important team activity. 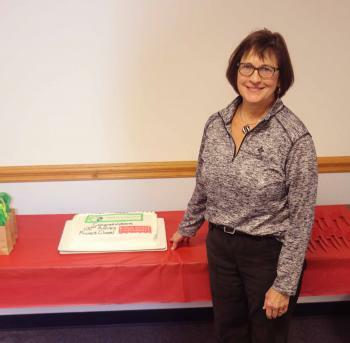 Since 2004, the farm management team obtained and managed 47 grants and gifts totaling $2,859,159 for women in agriculture programming in Iowa and nationally. In addition to USDA granting agencies, the team developed strong partnerships within the Farm Credit System to support this work. Grant and gift funds support local course delivery which significantly reduces the costs to participants. New course development, participant materials, field specialist mileage, printing, and evaluation are just a few of the expenses covered by these grants. Every farm management specialist contributes to the grants. Uniquely, every team member has served as a grant Project Director or Co-Director. This is just one of many indicators of the exceptional teamwork by this group. Recent grants and gifts managed by team members include the following. Over time, the farm management team has had several outstanding achievements in women in agriculture programming. A few highlights are listed below. 2005 - Tim Eggers developed two national Annie’s Project websites and documented program delivery methods, curricula, impacts and more. 2008 - Tim Eggers and Bob Wells completed a shared faculty exchange at CSREES/NIFA in Washington DC to share about Annie’s Project. 2012 – The national Agriculture and Applied Economics Association bestowed the Distinguished Extension/Outreach Program Award on the Annie’s Project national leadership team which included Tim Eggers, Kelvin Leibold, and Bob Wells. 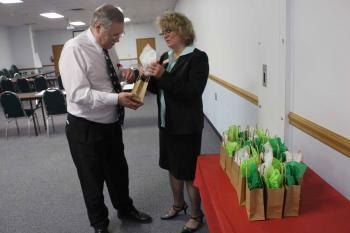 2013 – The team hosted an Annie’s Project Tenth Anniversary Celebration and Conference on the ISU campus. Governor Branstad signed a proclamation honoring Annie’s Project which was presented by Iowa House Representative Annette Sweeny. 2015 and 2017 – National Association of County Agriculture Agents recognized the team with Search for Excellence in Farm and Ranch Financial Management Awards. 2017 – Based on client concerns about crop prices, the team partnered with Landus Cooperative and others to host a Grain Marketing Forum on campus which was attended by 80 women. Research by the ISU Extension and Outreach Farm Management Team and their colleagues in other states, was reported in the December 2017 Journal of the National Association of County Agricultural Agents. The abstract stated that as leaders, family communicators, and visionaries of tomorrow’s rural landscapes, women are influential decision makers. They are stepping up to challenging and changing roles in agriculture. This creates a critical need for education directed specifically to this gender. 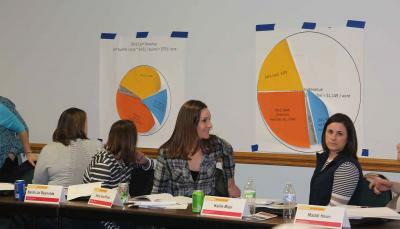 Annie’s Project educators from 14 fourteen states collaborated from 2013 to 2015 to evaluate program impacts. More than 677 women from 76 courses responded to the national survey. Annie’s Project courses were successful in extending knowledge in the five agricultural risk areas of finance, human resources, legal, marketing and production. Results indicate a statistically significant difference in the overall mean knowledge gains from pre-course assessment to post-course assessment with p>.01 in all content areas combined. Importantly, survey respondents who agreed or strongly agreed the Annie’s Project best education practices were implemented were more likely to make gains in knowledge than respondents who disagreed or strongly disagreed the practices were implemented. Results demonstrated participants took important actions toward managing all five agricultural risks. When farm and ranch women are empowered, they can contribute to a more sustainable agriculture by improving economic resiliency, conserving natural resources, and taking on influential roles in their families and communities. Extension educators have an important role in risk management education for women.